Saint-Tropez, Pampelonne is a preferred Major destination for yachts of all sizes in the summer; these floating hotels enjoy water sports as well as the natural environment of the bay.as they lay at anchor. 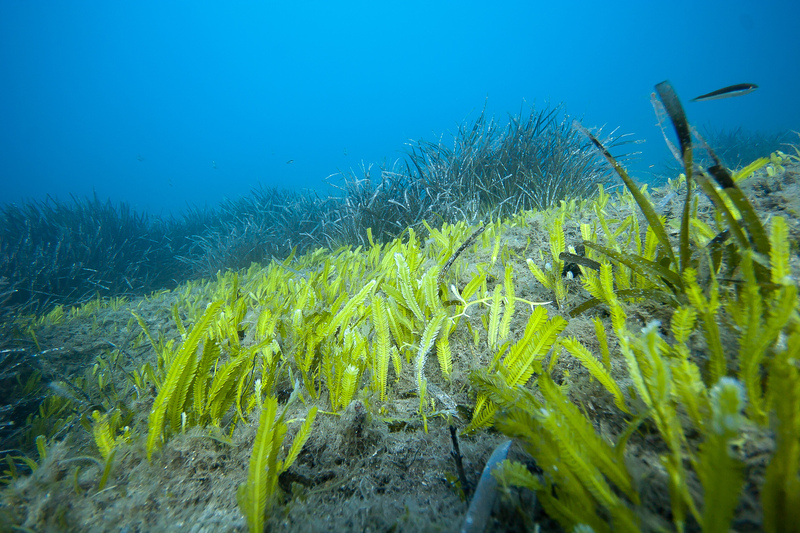 But this view of the bay remains incomplete as many visitors do not see the other side of Pampelonne marine wealth with its beautiful Posidonia meadows in the northern half of the bay in depths of up to thirty-five meters. 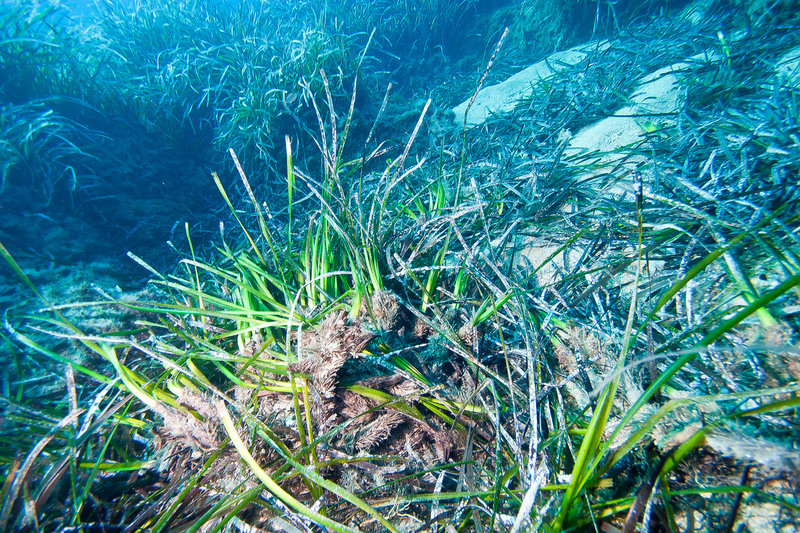 Posidonia is an endangered protected species and contributes to a rich ecosystem covering large parts of the Mediterranean and is in danger from yachting activities especially anchoring habits. How could we undertake conservation activities of these natural habitats? 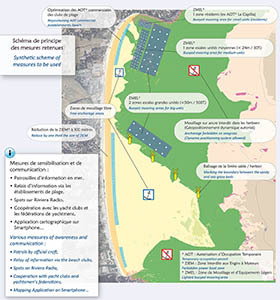 This question is at the heart of discussions concerning the development of Project Natura 2000 site Corniche Varoise (FR9301624), including Pampelonne beach area, where the stakes are greatest. Indeed, the scientific diagnostics performed in the area highlight the damage caused by moorings marinas and yachting. 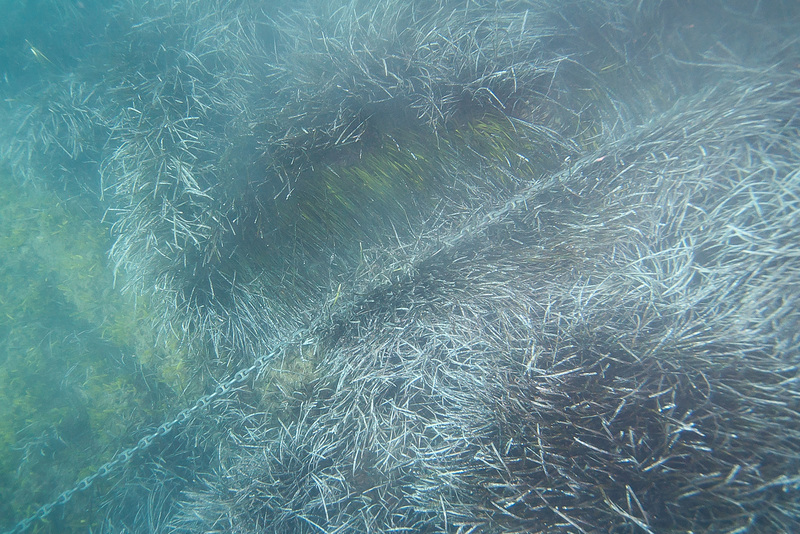 Documented degradation over many hectares shows the damaged grass roots where anchors have slipped and chain has chafed or uprooted the posidonia. Posidonia natural growth is so slowly being devastated. 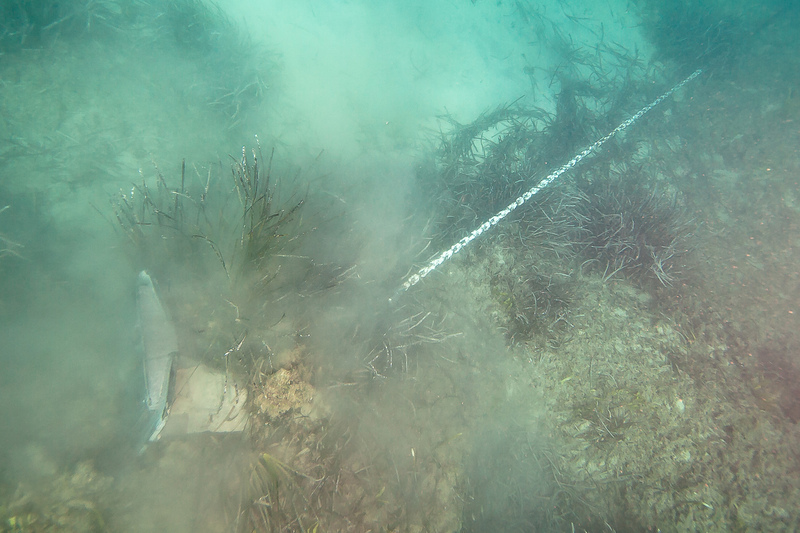 These degraded areas are largely being taken over and colonized by invasive algae such as Caulerpa taxifolia and Caulerpa racemosa, which is also moving to and taking over other anchorages. In order to act upon this devastation and to mitigate the impact of anchoring two working groups were organized in 2012 by the Observatory Marin acting in the capacity of operator of the Natura 2000 site, and chaired by the Mayor of Ramatuelle, All parties met with representatives of particular ports, representatives of yachting, the yachting industry and design offices specialized federations operators communities and state services (DDTM, semaphore, water police). This was complimented by a field survey of captains and crews of yachts whilst at anchor. The conclusions of these studies lead to future actions which specify the measures that will be phased in from the 2013 season. They aim to propose alternatives to current practices to combine the socio-economic presence, preserving the integrity of the marine environment. (For an overview of the organization of the water, refer to the synthetic scheme below). Repositioning AOT commercial establishments beach in the area vacated by the decline ZIEM..
Two areas for units smaller than 50 meters, 500 tons displacement. 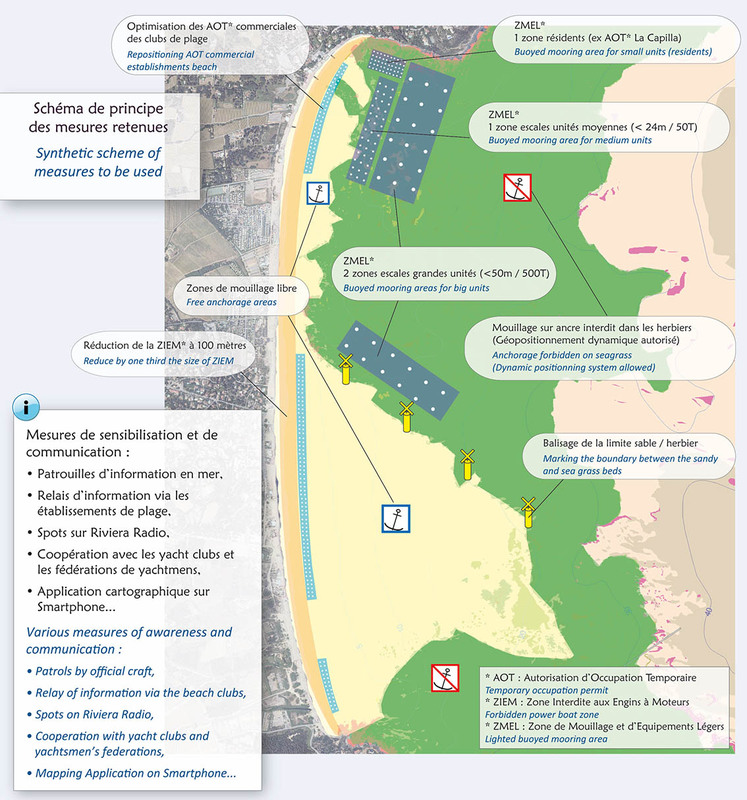 - Authorization of managed dynamic positionning system (D-positionning) over the sea grass beds off the ZMEL in depth of more than 10 meters. We hope that efforts will be made collectively by various users follow these steps to allow the grass to revitalize and marine life to flourish. The natural balance will be recovered for the benefit of a rich biodiversity, better bathing water quality and maintaining the best defense against natural sediment loss and erosion of the beach. Now, you can contribute to this collective enterprise applying these first steps and ensuring the preservation of sea grass beds. 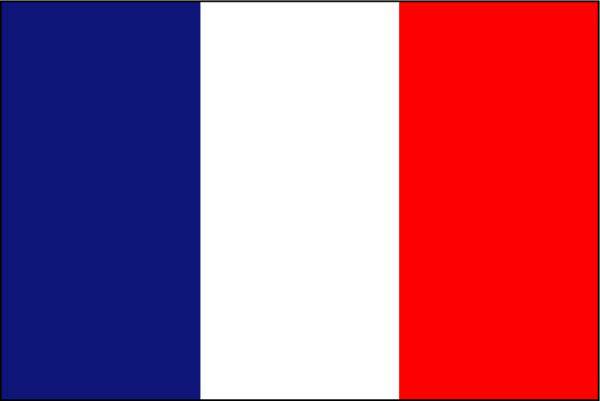 For more information, contact the Observatory Marin(Contact). Brochure "Anchorage in the Pampelonne Bay"